Chelsea has made a stunning move for Bayern Munich’s Robert Lewandowski. The Poland striker netted 43 times for the Bundesliga champions last season, as they clinched their fifth consecutive league title. But the 28-year-old is unsettled and criticised his team-mates earlier this month, accusing them of not doing enough to make him Germany’s top scorer. 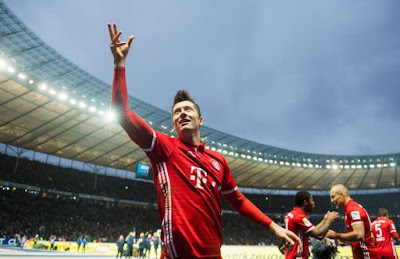 Lewandowski’s agent, Maik Barthel, this week said: “Robert told me that he got no support and that the coach [ex-Chelsea boss Carlo Ancelotti] gave no call to help him in the last game to win the top-scorer title. Chelsea are now trying to capitalise and have now made a serious enquiry. Blues boss Antonio Conte is looking for options to replace Diego Costa, with the Spain striker looking to rejoin Atletico Madrid, even though he cannot play for them until 2018 because of a transfer ban.